Ion may not be the first name you think of when it comes to action cameras (or the second), but the company has been around for a few years. The original Air Pro came in third in our action camera Battlemodo back in June of 2012, but it left us hungry for better image quality. The Air Pro 3 might just satisfy. For starters, the Air Pro 3 has the same basic form as the previous incarnations. It looks like one and a half D batteries stacked onto each other, and it has that easy to hit on/off toggle switch at the top. The biggest news is that Air Pro 3 is now waterproof to 49 feet as you see it above—no plastic case necessary. That's pretty damn sweet. It also has a standard quarter-inch tripod mounting bracket on the bottom. 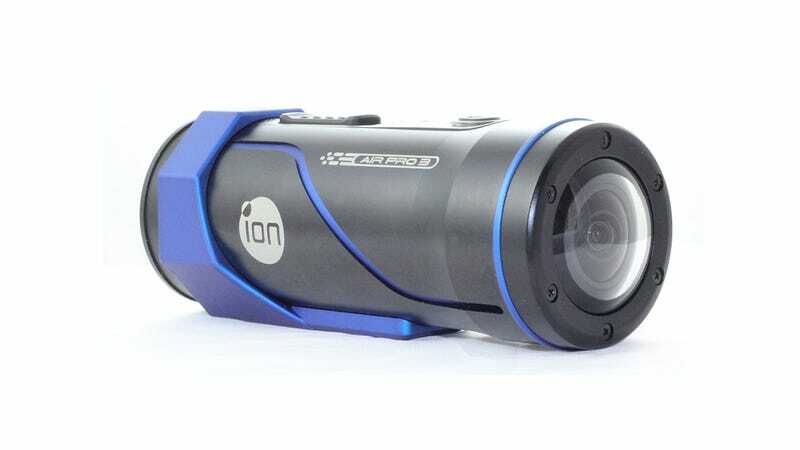 This is the first Ion with a custom-built lens (the lenses on the first and second versions were off-the-shelf), which goes to a maximum wide angle of 160 degrees. The company claims almost unnoticeable distortion, though of course that remains to be seen. Behind that lens is a 12MP backside-illuminated CMOS image sensor (the Sony IMX117), and a dual-core processor which we were told is the same one you find in the GoPro Hero 3+. As such, it too can shoot 1080p video at 60 frames per second and 720p video at 120fps. The Wi-Fi edition will include one of Ion's Wi-Fi Podz, which basically pops onto the back so you can use it to monitor and transfer files to your smartphone (iOS or Android). Through those apps you'll also be able to switch to a medium or narrow angle, should you so desire. There's also an upgraded mic with software noise reduction, and there will be more mounting options available this time. This all adds up to what sounds like a very capable device, but with promising new entrants like GoPro's Hero 3+, Sony's Action Cam 2, JVC's Adixxion GC-XA2, and Garmin's Virb, competition is going to be mighty stiff this year. We'll be putting them all through their paces in the weeks to come, so sit tight.